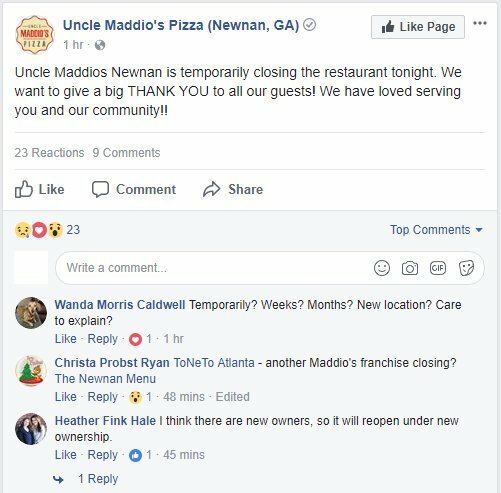 Uncle Maddio's Pizza in Newnan announced earlier this evening via their Facebook page that they will be "temporarily closing the restaurant tonight." The restaurant, which opened on Newnan Crossing Bybass in June 2015, was operated by franchisee Mike Uehling. Sources indicate that the restaurant will remain closed for the foreseeable future with it unlikely that anyone would reopen it as an Uncle Maddio's. The Newnan closure marks the 14th closure this year and 28th overall for the struggling chain which now has just 33 locations. Earlier this month, the Uncle Maddio's in Ocala "temporarily closed," while last month, Uncle Maddio's closed its corporately-owned location in Dunwoody's Perimeter Village. Started by former Moe's Southwest Grill co-founder Matt Andrew in 2008, Uncle Maddio's Pizza Joint was heralded as the next great franchise opportunity. Despite the Moe's Southwest Grill pedigree, the chain has struggled for years, and faces more challenges with the likes of Blaze Pizza and MOD Pizza both opening locations throughout metro Atlanta. 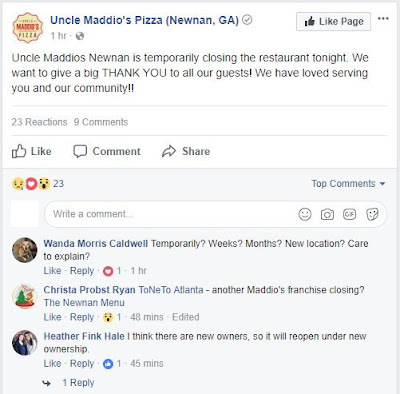 Following closures of Uncle Maddio's locations in Toco Hills, Buckhead, Cumberland, Midtown, Edgewood, Dunwoody, Newnan, Alpharetta and Woodstock, among others, the chain has just nine locations left in Georgia: Northlake, Acworth, Smyrna, Kennesaw, Buford, Canton, Gainesville, Savannah and Warner Robins. Despite recent claims that "Uncle Maddio's is on track to have 300 restaurants open in five years with 1,000 units in development," more restaurants are closing than opening, with a pipeline far smaller than the company would seem to be suggesting. Blaze Pizza, along with MOD Pizza, another national chain that recently entered the market, as well as local upstart Your Pie, have seemingly all performed better than Uncle Maddio's. The clear difference between the concepts is Uncle Maddio's conveyor belt pizza that cooks as its moves through an oven, rather than in an actual oven at the other concepts. The quality of the pizza is apparent, and it seems as though consumers are flocking to other concepts more as they continue to expand in metro Atlanta. The months ahead will likely bring even more closures of Uncle Maddio's restaurants. Are you surprised to see Uncle Maddio's locations continue to close? Are you a current or former Uncle Maddio's franchisee who would be willing to share your experience for an upcoming post? Do you think Blaze Pizza will succeed where Uncle Maddio's failed? No dog in the fight here, but I have to take issue with your editorial tone. I think it best to root for local franchises, rather than revel in your prediction of future failure. The restaurant industry is brutal to say the least. I always liked Maddios, and used to frequent the one at Toco Hills. While it's certainly not the best pizza you could possibly buy, I think it's good for the price. Although I must say, I think MOD's pizza is even better, and I like that they you can get unlimited toppings for the same price (unlike Maddios). There is a reason that Mod has unlimited toppings for the same price and Maddio's Pizza does not......it all shows in the quality of food. "Blaze Pizza, along with MOD Pizza, another national chain that recently entered the market, as well as local upstart Your Pie"
While Your Pie began locally (I attended the Grand Opening of its first location on Alps Rd. in Athens in 2008), it has locations in California, Arizona, Montana and Colorado, along with locations in the Upper Midwest, Texas, Maryland and all over the southeast, and thus seems now to be a national chain, just like Blaze and Mod. Since it is older than both Blaze and Mod, it's not really an upstart, either. Love this place. The wife and I drove from Fairburn, just to eat there. Very disappointed. We always loved going to Uncle Maddios. The atmosphere was always great and our kids LOVED family night. Very sad to see it go as it was the best family pizza place to us. It is unfortunate that it closed. Got a pizza there on my birthday and my church had a fundraising effort w/them.